Smorgasburg -- the acclaimed NY market focused on emerging chefs and concepts that's launched Instagram-friendly food trends like the Ramen Burger -- is finally coming to LA in a new Arts District space called ROW DTLA on Sundays beginning June 19th. 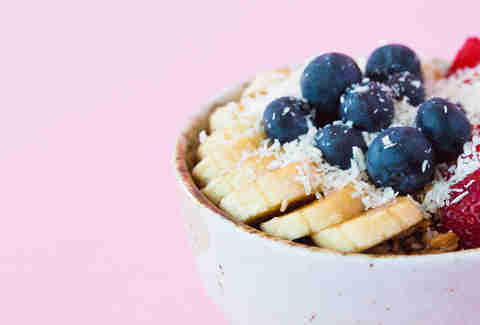 This brand-new vendor does açaí bowls and other superfood-type goodness -- with a twist. Zach says: "It's served in half a coconut. A hollowed-out coconut! It's going to be awesome! Imagine 100 people walking around Smorgasburg in the heat with these hollowed out coconuts." This banh mi concept comes from guys who have done time at Providence and Red Medicine (RIP). 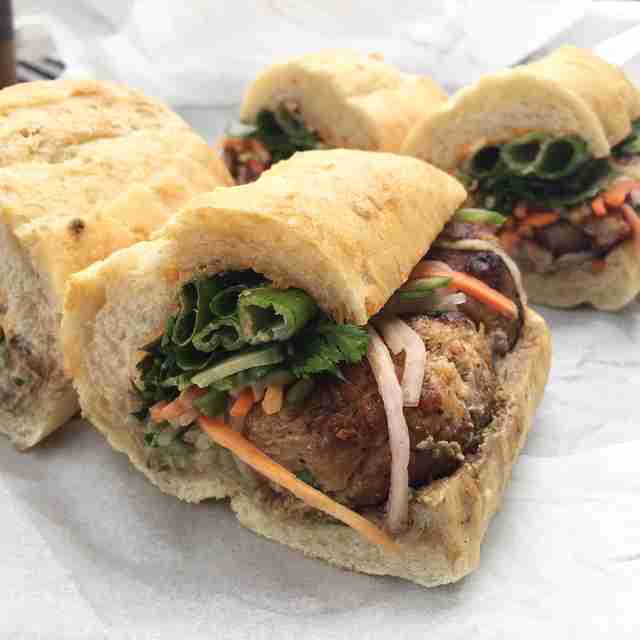 Zach says: "Did you ever have the banh mi at Red Medicine? This is even better. They bake the bread themselves, it's the right size, and it's based off of this banh mi they had traveling in Australia. It's just gooood." This NY-Smorgasburg favorite -- which fries up hand-pulled mozzarella into mozzarella sticks -- is making its first entry into LA. Zach says: "Dude. Fresh pulled mozzarella. Made into mozzarella sticks. Where do you get good mozzarella sticks in LA?? Nowhere!! So excited." This new stand from the guy behind Mexicali and Salazar combines French fries and Mexican food for multi-culti taste explosions. 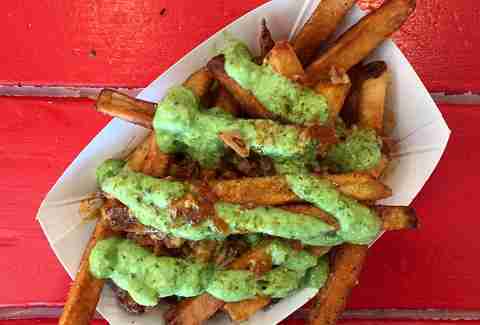 Zach says: "They're doing grilled meats topped with French fries and califa sauce, which was inspired by two of his favorite sauces in LA -- the green sauce at Mario's Peruvian, and the vinegar-based marinade at Dino's [Chicken and Burgers]." Ted Montoya -- a guy who did time at Corazon Y Meil and Free Range LA -- brings his takes on the Mexican stew posole and more. Zach says: "This dude's posole is exactly what you want to eat hungover on a Sunday morning at 10am. Also, he's going to have tamales!!!" This NY import specializes in choripan -- a sort of chorizo baguette sandwich -- topped with their signature sauce. Zach says: "They're a legacy vendor -- we have a few legacy vendors that are part of the Smorgasburg family. And dude, it's homemade chimichurri sauce. It's gonna be good. Where else do you get choripan?" Also a NY favorite, this Indian-meets-Mexican vendor parlayed their Smorgasburg success into a Lower East Side brick & mortar. Zach says: "I'm so excited for this one. They've been wanting to do something in LA -- and this is going to be their launch. 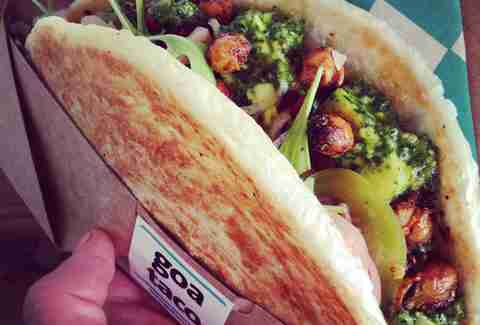 It's a taco with paratha -- Indian flatbread -- instead of a flour tortilla; they're doing stuffings like slow-roasted pork belly and tofu." Beth Kellerhals -- the woman who invented the Kogi chocolate Sriracha bar -- drops her first solo concept, serving up all sorts of biscuits. Zach says: "Dude, biscuits! There'll be sweet and savory -- biscuits and gravy, or biscuits with potted cream and jam." This ramen shop hails from Tampa (????) and is best known for the mashup dish the invented, the CuBaoNo. Zach says: "It's like a Cuban sandwich, and Tampa's really well known for their Cuban sandwiches -- with bao instead of bread, put in a press with ham. The bao it gives it a sweetness, like an Asian medianoche (a Cuban made with egg bread instead of French bread)." Big ol' lobster rolls and more, from this crustacean newcomer. Zach says: "If you want to come and hang out in the sun and eat a whole grilled lobster with garlic noodles, you will be able to do that. And you want to do that! We're bringing the beach to Smorgasburg." Before they opened Ostrich Farm, the owners used to have this beloved breakfast-and-more cart in Silver Lake; this is its triumphant return. Zach says: "Who doesn't like eggs on everything? That's what it's going to be: they're going to do a burger with an egg on it, and there's basically eggs on everything they serve. Honestly, before there was Eggslut, there was Monsieur Egg." You know how LA doesn't have a lot of great bagels? The former GM of Gjusta is out to change that. Zach says: "Future contender: best bagels in LA. 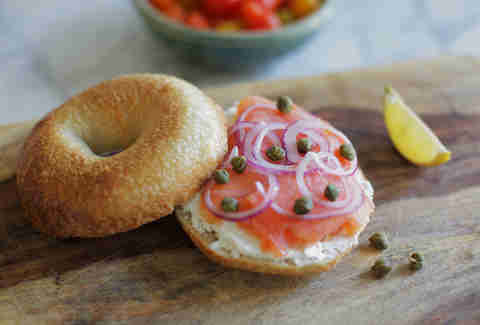 They are real, NY style bagels -- they're the right size, they're dense in the right way, -- they're the perfect bagel. He does these perfect NY style bagels, but his signature is a jalapeno cheddar bagel, which you can get with a housemade lime zest cream cheese and pickled radishes, which are awesome." Fresh-dipped chocolate bananas, with toppings like coconut, rainbow sprinkles, and... salt?? Zach says: "They're hand-dipped at the event itself, so they're fresh -- not packaged. I hear there's money in this sort of thing." The guys from Ramen Burger are launching this new poke concept at Smorgasburg, with a focus on traditional prep. Zach says: "If I'm involved, you know there's going to be poke -- and there is. They want to be traditional using this hard-to-find red sea salt, and it tastes great." 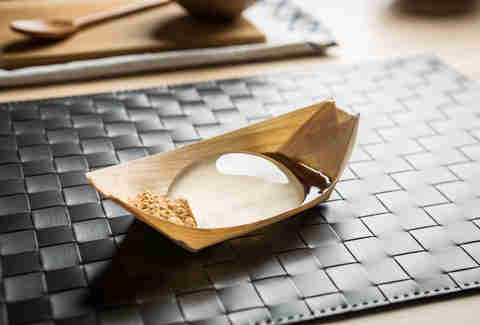 Unquestionably the breakout dish of this past season in Smorgasburg NY, this Asian dessert (made from "barely solidified water" and served with brown sugar syrup) makes its LA debut. Zach says: "Have you seen this on Instagram? Have you tried it yet? Do you want to? Of course you do." This congee-and-mochi-beignets shop also does seasonally focused plant-based veggie dishes. 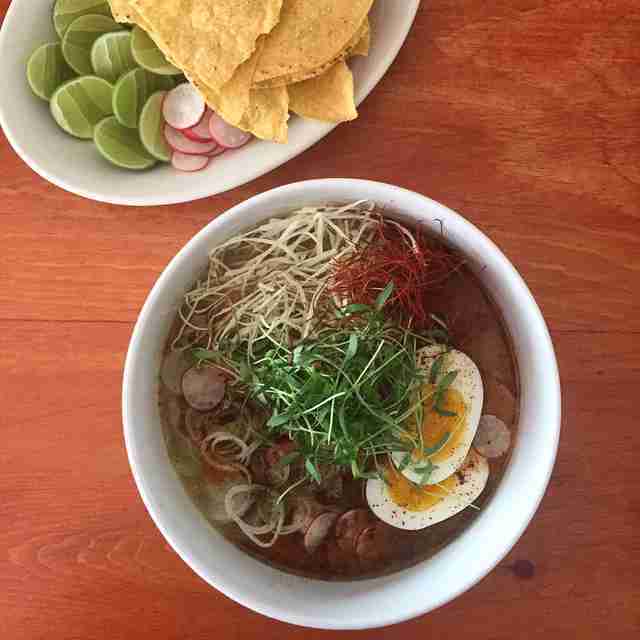 Zach says: "This is a Jonathan Gold favorite that's been homeless for eight months. We're giving her a new home. I want Jonathan Gold to come to Smorgasburg, and I thought this was the best way to make it happen." The original Smorgasburg breakout (which is literally a burger with ramen as the buns) used to also be served at a now-defunct take-out window in Koreatown. 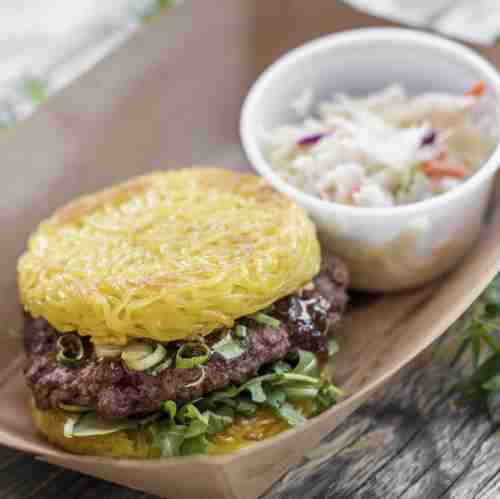 Zach says: "Ramen burger is as legacy as you get with Smorgasburg -- they got their start there -- so of course it's going to be at Smorgasburg in LA. We wouldn't have it any other way. It is an inextricable part of Smorgasburg." 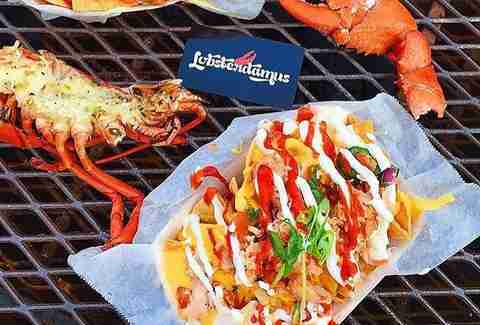 This NY Smorgasburg favorite's lobster rolls have been called among the best in the nation. Zach says: "We were really excited to bring them from NY, and this is one of them. 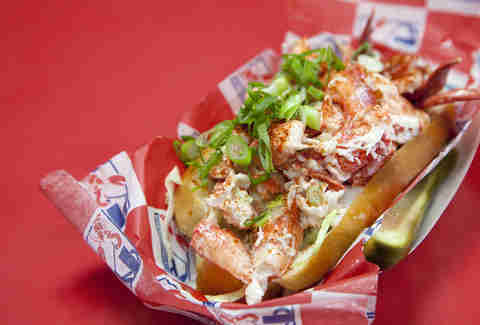 It's a great lobster roll, and you can't get it anywhere else. For New Yorkers, it's got name recognition, for sure." Have you ever had the donuts at Cofax? You know, the ones that are TOTALLY AMAZING? 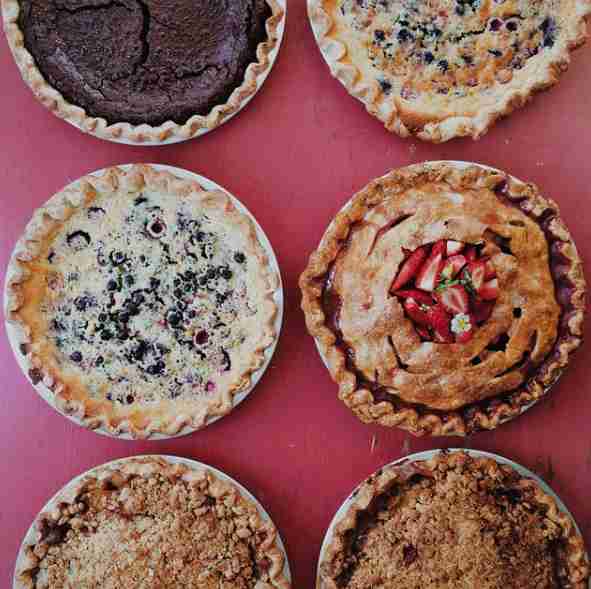 Yeah, these are pies from the same baker, Nicole Rucker. Zach says: "The menu's going to change all the time. Her chocolate pie is legendary. Her apple pie is legendary. I've heard rumors of a Vietnamese ice coffee pie that I can not confirm or deny. This sort of insanity is what we're talking about." The press release says "Toasts, pastries and other baked goods from 3 chefs who met while working at Milo & Olive." But, as Zach points out, there's much more to that story. 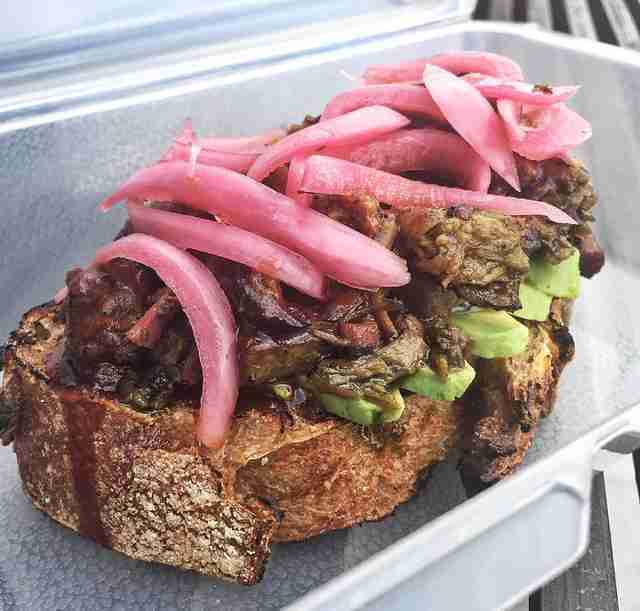 Zach says: "They're doing avocado toast, but it is going to come topped with smoked brisket. And during the week they work at [award-winning BBQ spot] Maple Block. So you know it's gonna be great." Erik Black -- from acclaimed BBQ spot Bludso's -- is making his own smoked meats, plus papaya slushees. Zach says: "If you had Ugly Drum's pastrami three years ago when they popped up at Mendocino Farms and Spice Table, you're incredibly excited about this. And if you didn't, you should be. And now, for Smorgasburg, they're also doing homemade hot dogs." 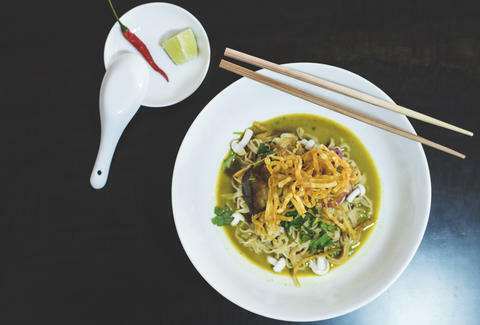 They have, like, all sorts of noodles, including spicy mazeman ramen, pho, and khao soi. Zach says: "This was one of the first vendors we signed up to Smorgasburg -- it's a lot of what Smorgasburg is all about, a guy who's worked at a ton of different restaurants and is trying something new on his own. I went to his house for a tasting, and he made three different noodle dishes from three different countries, and they were all great. I'm very interested to see what he does." Jeff Miller's probably eaten 100+ lunches with Zach Brooks, but knows their first Smorgasburg meal together will be the best one. Watch it happen at @jeffmillerla on Instagram.